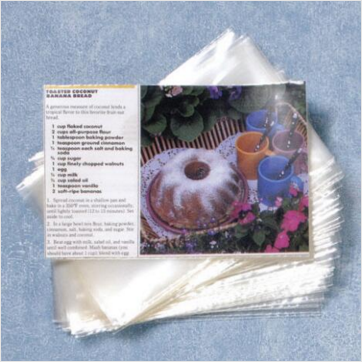 Protecting your treasured recipe cards from generation to generation is easy with recipe card protectors. We have searched various sites to find recipe card protectors to cover your cards fit your needs. 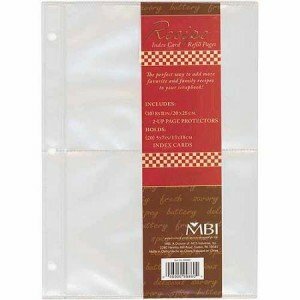 Most recipe sleeves are made from vinyl and are either single sleeves sold in sets or fit in a binder like a photo sheet. Click here to view recipe card templates and cards for your collection. If Amazon doesn’t have a recipe card protector that fits your needs then it probably doesn’t exist! Protect your treasured recipes from life’s little mishaps. 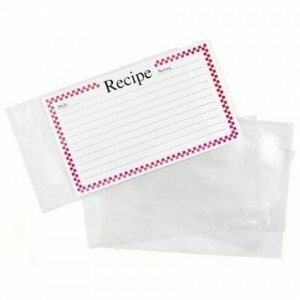 Clear vinyl protectors hold your 3″ x 5″ or 4″ x 6″ recipe cards and keeps them safe from messy fingers and splatters; wipe clean covers. Walmart offers a selection of types and sizes. Whether you are looking for recipes covers that are card size or fit into a binder, you will be able to find both on the Walmart website. Thank you for sharing!! I two collect recipes, I am hooked on old church and community cookbooks and must have about 90 now. My husband bought me the “The living Cookbook” soft ware and I have spent hours going through my books selecting recipes to add to my collection so I can truly appreciate the work you have put into this website. I could spend hours reading the recipes and the history behind them.